I currently work for an online marketing agency which specialises in SEO, PPC, CRO among other things. My role as a Strategy Developer requires me to use my initiative to develop useful tools to improve efficiency around the company. These tools have formed the company's Intranet. I have been interested in website development since I first started using the internet and I have created a number of websites throughout the years. These have quickly improved my development and design skills through solving the challenges and problems that have come and gone. This portfolio outlines my major achievements and shows some of my work. FFXIV Info is my proudest achievement in terms of being a developer. It is a fan site for the MMORPG Final Fantasy XIV: A Realm Reborn. 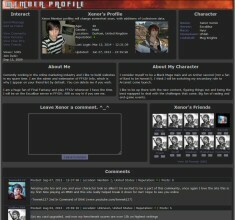 The site began life in 2009 when FFXIV was first announced at E3 and grew towards the game's launch in September 2010. Unfortunately the game failed spectacularly within months and the makers Square Enix decided to scrap it and redevelop a better version. 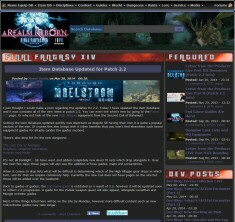 Like the game, FFXIV Info was reborn with a fresh look and feel ready for the game's relaunch in August 2013. Gearing up for the launch meant scraping all existing content and replacing it with content relevant to the new game. With the advantage of already having a small fan base from the original game I was able to build upon this and get content out there quickly before competitor websites. The culmination of this work saw a peak traffic of over 50000 visits per day during the game's launch week. It has since dropped as you would expect with any product that has been out for a while but I remain happy with current performance. The website itself is built using PHP, MySQL, JQuery, CSS and HTML and runs on a custom built VPS with the Nginx web server. The site features a full users system, commenting, forums, unique content and social media integration to give people a reason to come back. In order to bring in more traffic I have also been using social media marketing, PPC, and SEO techniques to improve search engine visibility. 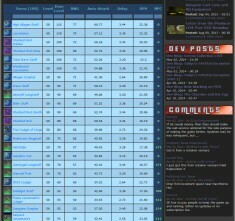 Compilation of Final Fantasy VII my oldest website that is still online, and as a result is starting to show its age. 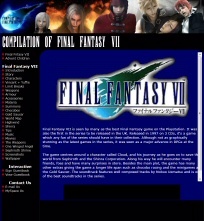 Built in 2006 as an extensive information resource for the 1997 videogame Final Fantasy VII and the film Advent Children it servers its purpose without all of the bloat that comes with a modern website. The site uses a more traditional design of having a menu on the left with content on the right and is made using advanced HTML and CSS methods. While it could certainly be updated with a more modern look the current demand for info on a 17 year old videogame is quite low and more important projects take priority. 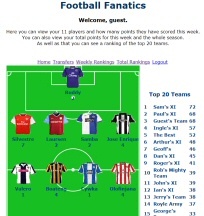 Football Fanatics Fantasy League was created as a result of a team project during my degree in which we had to develop a database and a method of interacting with it. We choose to make the FFFL game. 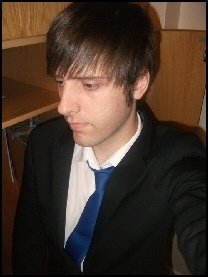 I took on the lead web developer role and was responsible for creating the website that the user would use to interact with the database. The site is built in PHP, HTML, CSS and MySQL. For the whole project our team was awarded a 1st. Please Note: While the website is online and functional, it is not updated or advertised to the public. It is online only to provide an example of my previous work to interested people so please keep this in mind.